Irrespective of the country and religion of their birth or the time in which they appear, Saints and mystics come to this world to put people on the path to God-realization and redeem them from the suffering of the unending chain of birth and death. Right from the beginning of time, there has been only one religion in the true sense of the term-in the sense of man's quest for God. True, there can be various creeds and religious groups; the people adhere to, but at the core of man's quest is the thirst of his soul for union with the Lord. The fulfillment of this urge can be attained only through love. The soul has to merge in this source and lose its separate identity. It is difficult to find a generally accepted name for such consummation, the essence of which is the mystic communion. In its ultimate form, this experience of spiritual realization is beyond the scope of time and space-in fact, beyond all limitations. The soul can transcend the empirical state of this transient earth, the prison house of this sordid material realm, through spiritual practice. Training and guidance for this can be imparted only by the Saints. 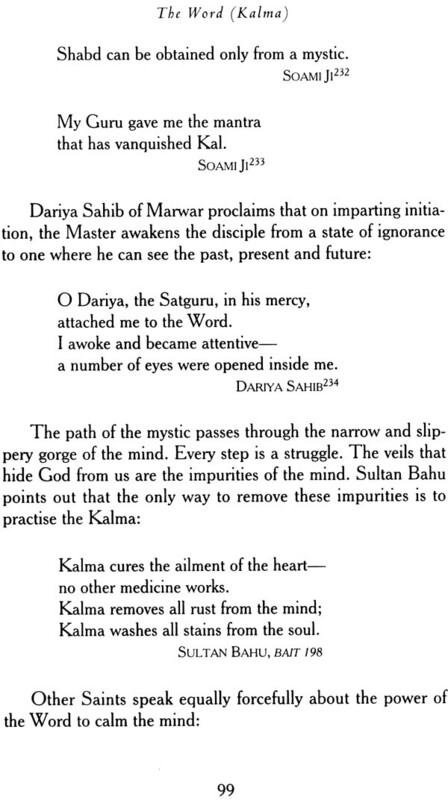 Hazrat Sultan Bahu, whose life and teaching are presented in this book, was one of the best-known poet-Saints of; the Punjab. 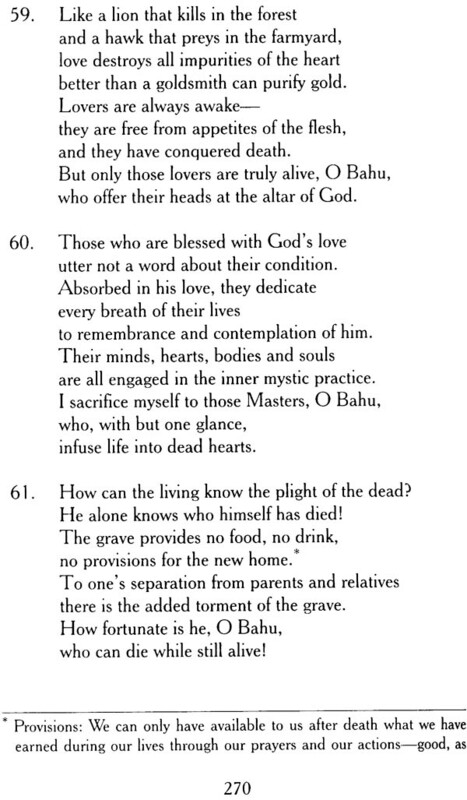 Bahu was a contemporary of Saa'in Bulleh Shah (1680-1758); he spent most of his life in West Punjab (now in Pakistan), wrote a large number of books in Arabic and Persian and is also said to have authored several poetical works in Punjabi. Of the latter, the only one to survive is the Abyaat, which consists of some 200 verses. 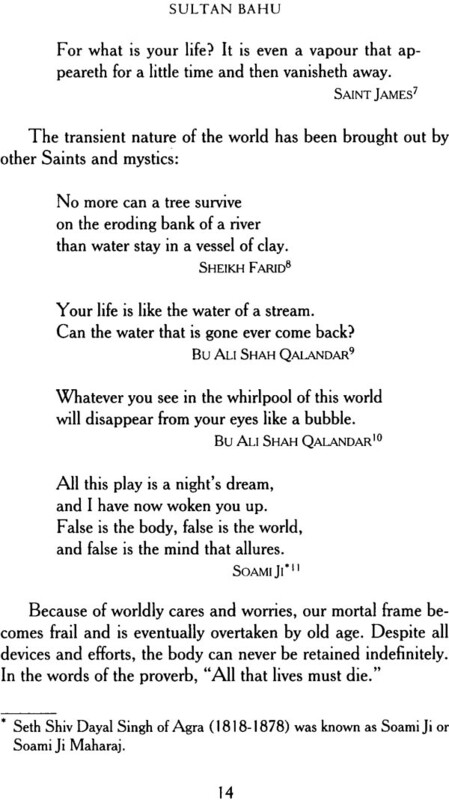 However, while an essentially Punjabi quality and flavour pervades the kafis of Bulleh Shah (tempered by an occasional use of the idiom current in the mystic literature of the rest of India), the abyaat of Sultan Bahu employ a rustic idiom while also showing the marked influence of the writings of the Sufi Saints of Persia. This is probably due to the fact that Sultan Bahu was an eminent scholar of Arabic and Persian and an exponent of Islamic philosophy. Though few in number, Sultan Bahu's abyaat are cherished by the people of Punjab as a part of their cultural heritage and-because of their poetic beauty, simplicity of expression, and deep spiritual meaning -have been a source of inspiration to them for generations. 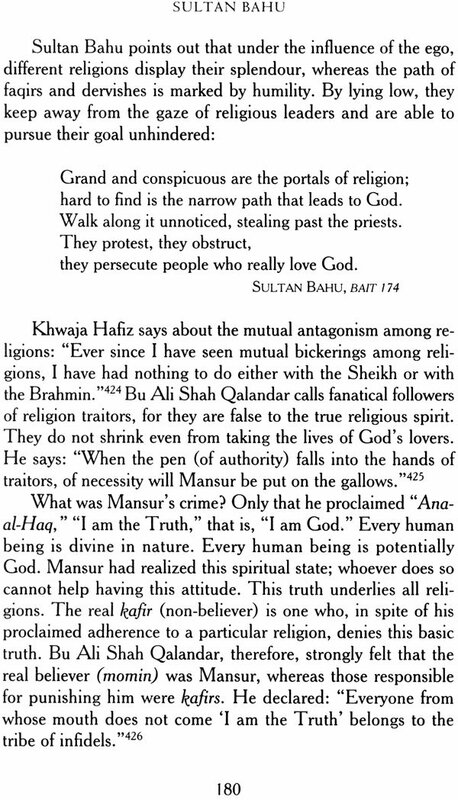 Bahu's abyaat tell us of the true essence of religion and warn us against false manifestations that masquerade in the name of religion. 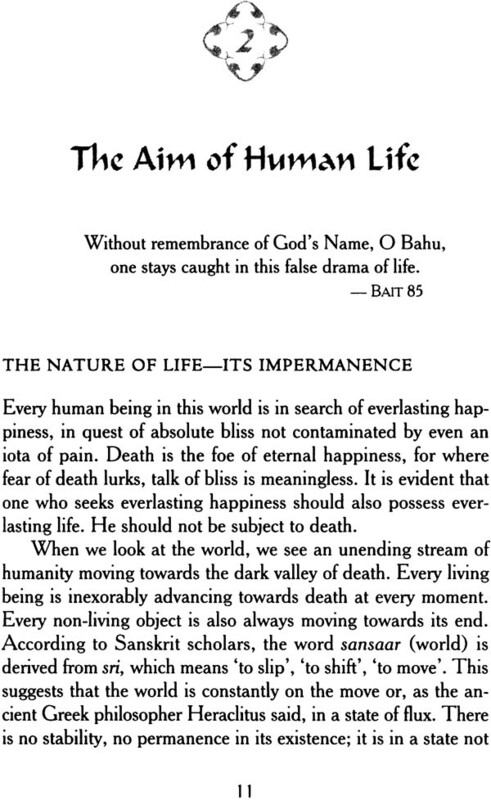 In this book, the authors have attempted to bring out the true mystic import of Bahu's teachings. 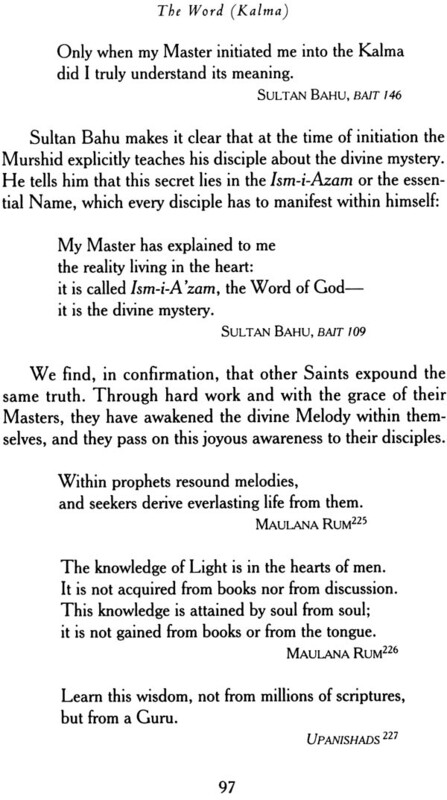 In discussing the writings of Sultan Bahu, they have drawn parallels with the teachings of other great mystics and cited thei verses, mostly in Persian and Punjabi. 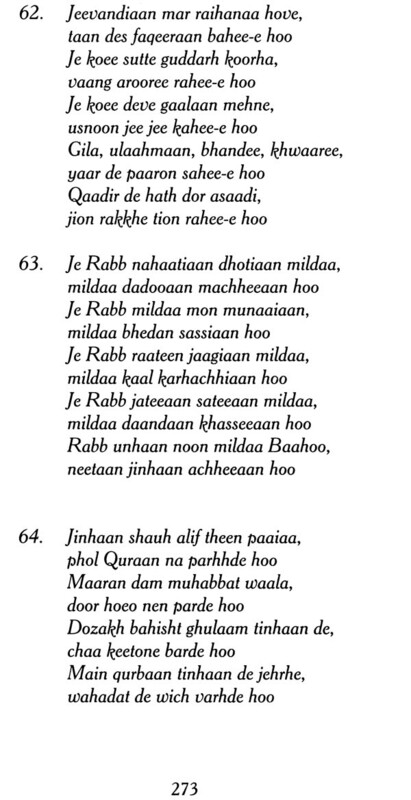 (Many of the original verses in Persian and Urdu are included among the endnotes at the back of the book.) 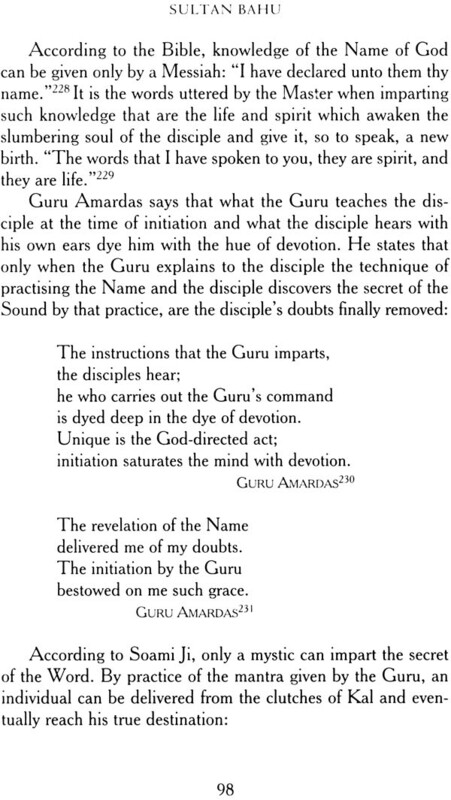 The authors seek thereby to emphasize not only that the ultimate goal pointed out by various Saints is the same, but also that the method they teach to attain it is essentially the same. 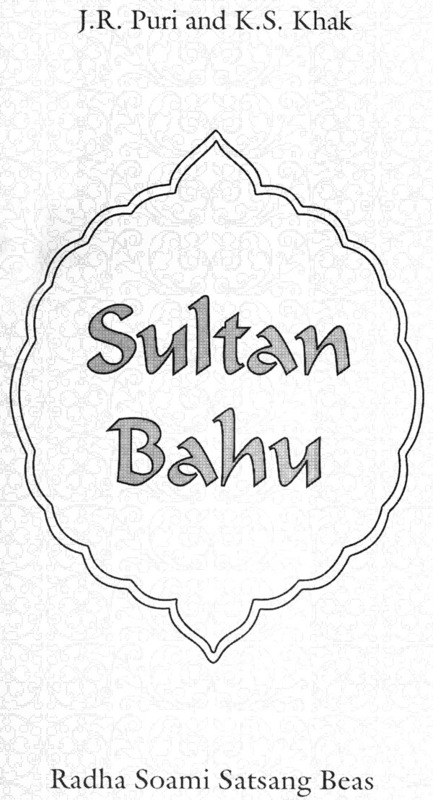 At places, to elucidate the teachings of Sultan Bahu, the authors have referred to some of his Persian writings. They have noted the sources of material they have cited wherever possible. Nearly two dozen editions of Sultan Bahu's abyaat have been published by different editors and writers. The number of poems included varies from 114 to 202. There are some obvious defects of metre or prosody in almost all of them. The main reason for these shortcomings is that the abyat of Sultan Bahu were reduced to writing on being sung by qawwals. When poetry is presented in the form of music, its defects of metre and rhythm are likely to remain hidden. These defects are compensated for by the time and mode of music in which the poem is sung. When, however, the same composition is printed and read, any imbalance in rhythm and metre becomes perceptible even to a layman. It is inconceivable that a writer of Bahu's experience and acumen, who authored about 140 books in Arabic and Persian-including a diwaan of Persian ghazals - could have made such rudimentary mistakes. A thoughtful step towards rectification was taken by Nazir Ahmed, an eminent Pakistani scholar. He contacted distinguished schools and editors in Pakistan and India and collected, scrutinized and compared numerous original handwritten manuscripts, as well as various editions of the abyat. 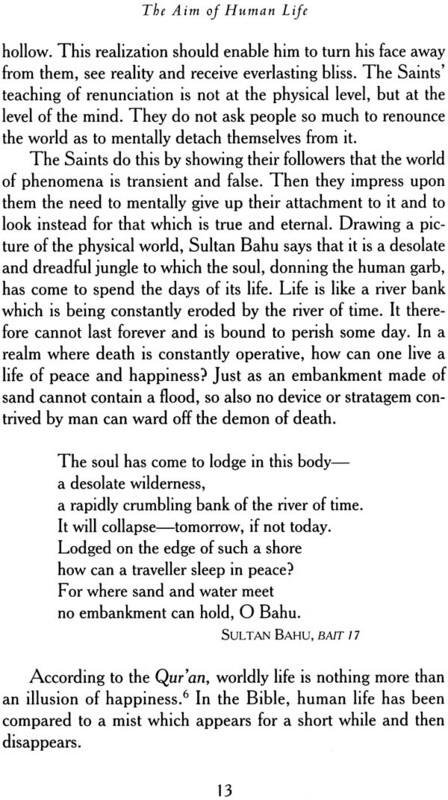 He was then able to bring out a corrected version, published under the title kalam- I-Sultan Bahu. All keen students of Bahu's abyat will be grateful to the compiler for his diligent efforts. Most of the poems quoted in the present book are drawn from out by Dr. Ahmed himself, defects of metre remain in a few lines. The authors have made a further effort to remove some of these imbalances. The few remaining imbalances appear in lines where any change of words might affect their original meaning. As for the number of abyat and the order in which they appear in this book, the scheme in Sultan Altaf Ali's Abyat -I-Bahu has been broadly followed. Sultan Altaf Ali's book contains 202 abyaat, while Dr. Nazir Ahmed's book prints 188. 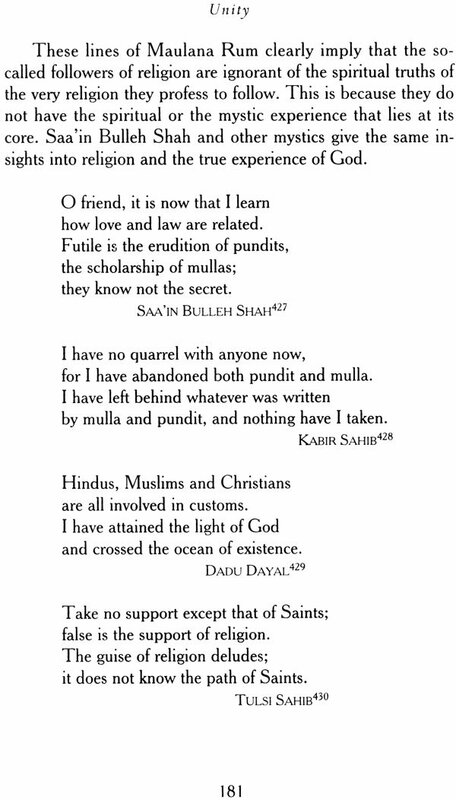 Some of the poems in Abyaat-I-Bahu have been omitted, and a few have been selected from Kalam-I-Sultan Bahu. The metre of the additional abyaat taken from Abyaat-I-Bahu has also been set right, wherever necessary and possible. The collection is indexed at the end of this book, and references to the baits accord with this index. 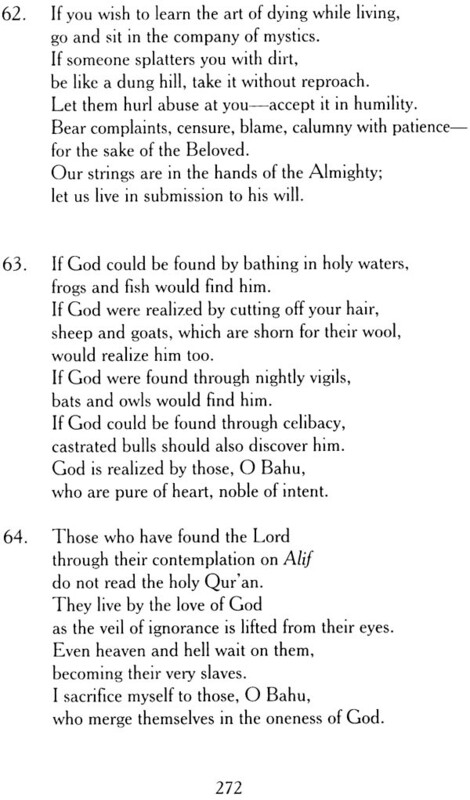 Facing the English translations of the abyaat in Part two are phonetic renderings of the original Punjabi verses. Since the main purpose of this book is to bring out the mystic significance of various aspects of Hazrat Bahu's teachings, a detailed treatment of the characteristics of his style and diction has not been considered necessary. 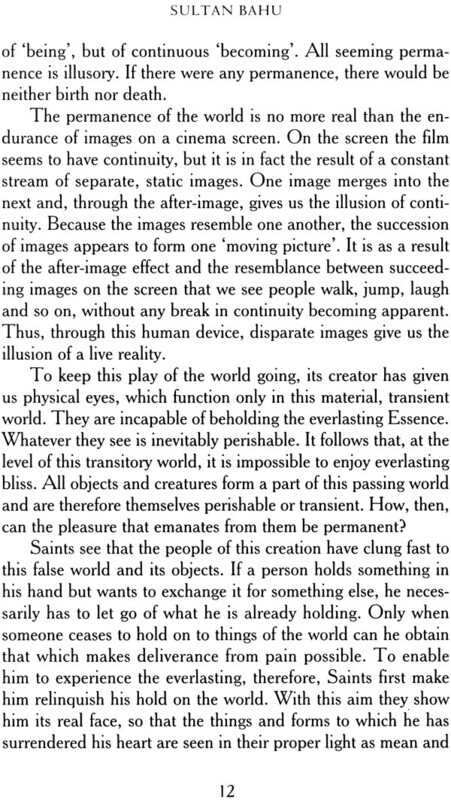 Only a brief account is given of this aspect at the beginning of Part Two. Footnotes are used sparingly to give definitions of unusual Persian, Arabic and Punjabi terms used in the text and poetry. All these, and other terms and names that might be unfamiliar to the modern reader, appear in the glossary and biographical notes included at the end of the book. Sources and references are given as endnotes, rather that in the body of the book, to make the text more readable. 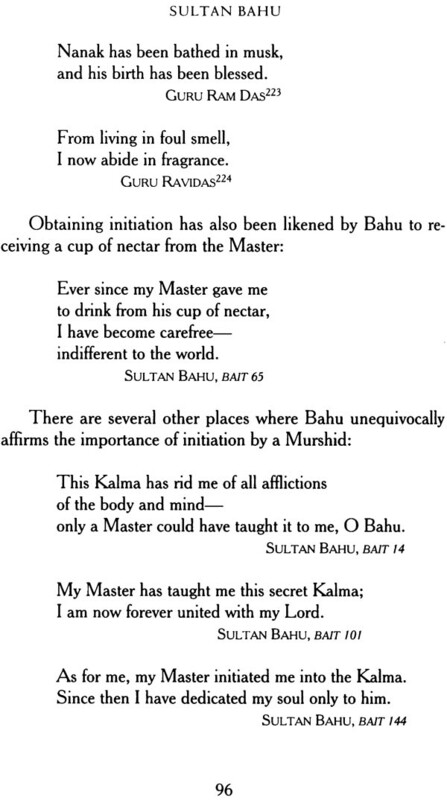 This may be the first attempt ever made to interpret Sultan Bahu's abyaat from the spiritual or mystic point of view. Considerable research has gone into this effort. How far this has been successful is for the reader to judge, and we would be grateful to anyone who brings to our notice any defects or shortcomings in this work, so they may be removed in the next edition. Professor Janak Puri, one of the authors of the Punjabi version of this book, died while the English edition was being prepared, and a team of his colleagues has brought it to completion. 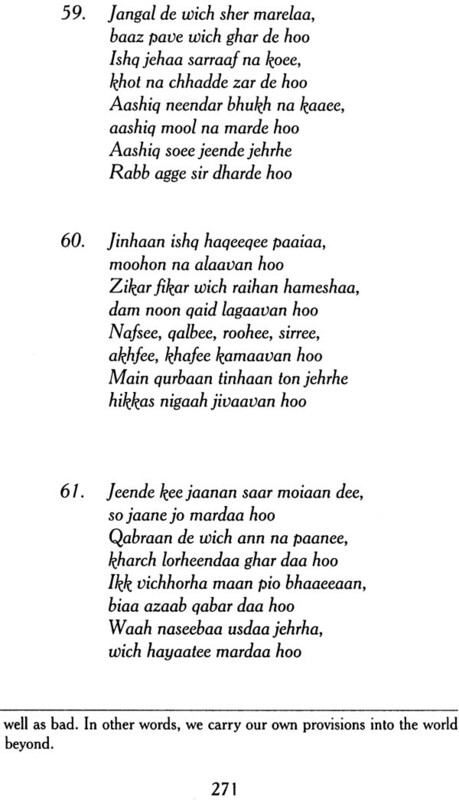 The preface to the Punjabi version concluded with the following words by Professor Puri and the book's co-author, Professor Kirpal Singh Khak. It was our great good fortune that Maharaj Charan Singh, through his grace, gave us the opportunity to write this book. The Master is the great doer. When he wills to see a project accomplished, he assigns the task to someone, who is a mere instrument in his hands. After all, what can we poor mortals be except his instruments? Is it not our good luck that he had so graciously selected us, inept instruments, to undertake this work? Notwithstanding his multifarious engagements, he gave us a great deal of his time and explained to us the deep spiritual meaning of many of Sultan Bahu's baits.